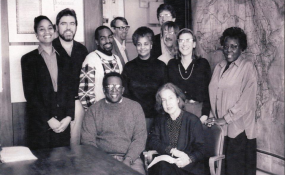 Ambassador Dumisani Kumalo with American Committee on Africa Executive Director Jennifer Davis (seated) with the ACOA staff (about 1985). Dumisani Kumalo, a leading anti-apartheid organizer in the United States who later served for a decade as South African ambassador to the United Nations, died on Sunday evening after a lengthy illness. "He was a major and defining force in the divestment movements," his long-time friend and author, Stephanie Urdang, wrote on the 'R emembering Dumisani Kumalo ' page on Facebook. A fter being forced into exile from South Africa where he was a crusading journalist , Kumalo served on the staff of the American Committee on Africa (ACOA) and the non-profit Africa Fund from 1979 to 1997, mobilizing support for sanctions across the country.
" He worked tirelessly and effectively to end U.S . economic, military and political support for white minority rule during the 1980s and 90s," wrote Michael Fleshman, who shared a cubicle with Kumalo at the two sister organizations in New York. After his retirement as ambassador, Kumalo became CEO of the foundation established by Thabo Mbeki, the president who tapped him for the UN post. In a statement of tribute, the Foundation credited Kumalo with "securing our country a non-permanent seat on the UN Security Council." "Coming from the ranks of the liberation struggle, Ambassador Kumalo required no tutelage to appreciate that he was not only a representative of his country but part of the larger contingent of the African and Global South diplomats whose primary task is to serve as a united voice of the Wretched of the Earth."